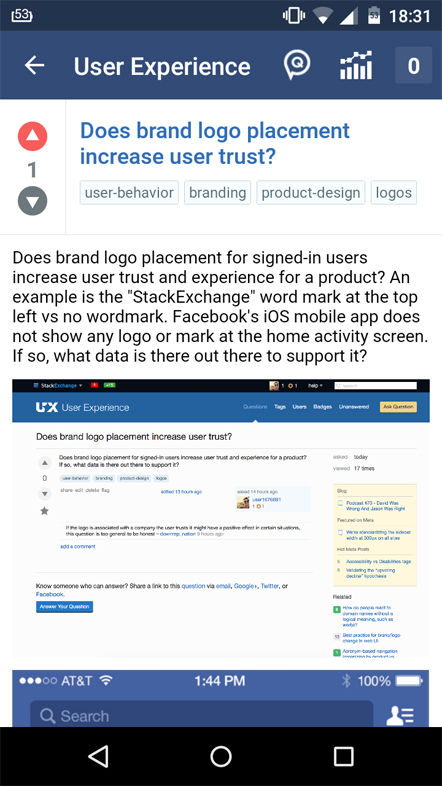 Does brand logo placement increase user trust? Does brand logo placement for signed-in users increase user trust and experience for a product? 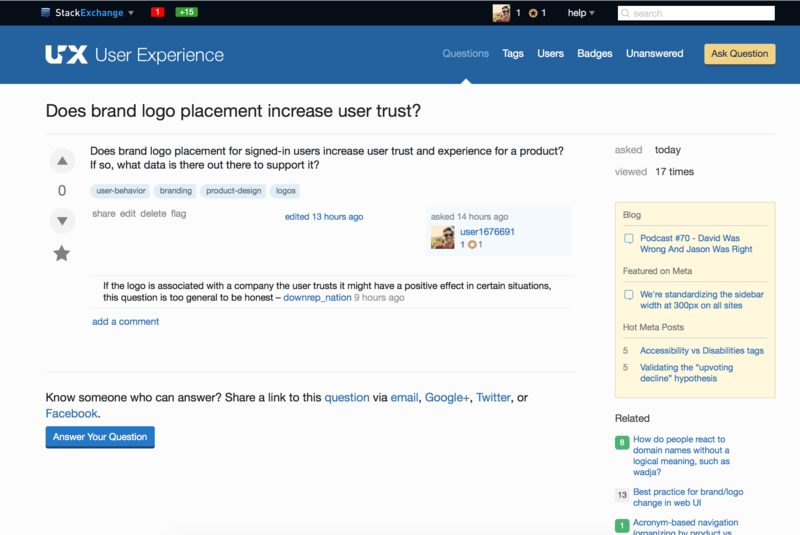 An example is the "StackExchange" word mark at the top left vs no wordmark. 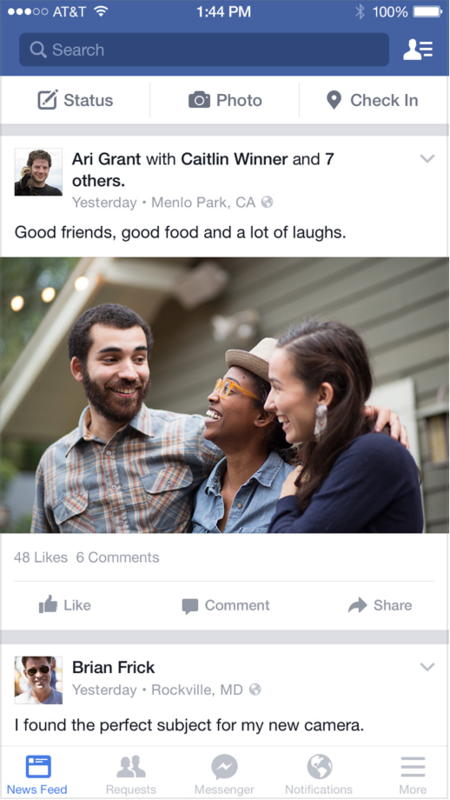 Facebook's iOS mobile app does not show any logo or mark at the home activity screen. If so, what data is there out there to support it? Short answer: Yes. What you are looking for is the mere-exposure effect. It has to do with both brand awareness and space. UX StackExchange indeed displays its logo in the header of the website, but in the app (and on the responsive website), there is no logo in the header bar. Facebook does the same. On the website, you'll see the "F" word mark, but in the app, there won't be word mark or a logo. Let's split up the explanations between apps and websites. Apps: Every user opens an app by pushing the logo on their home screen, so in most cases, it's unnecessary to repeat the icon (considering that the user already trusts the company because he/she already installed the app). Also, every pixel counts, so putting a word logo in a small screen isn't the best choice. Websites: There are more ways to land on a website than to land in an app. The user hasn't seen the logo of a website before clicking a link to it. If you want people to see your logo, then it should be displayed on the website (logically). Large social media companies only show their logo when you're not registered yet. So they do show them! But when you are logged in, you'll mostly see a word mark, because these large companies already gained your trust. Otherwise you wouldn't have signed in. If you own a small company, you might want to throw your logo out there to build some brand awareness and trust, like the mere-exposure effect explains. Repeating your logo is good, but repeating an untrustworthy-looking logo isn't. I don't have to explain that, right? You'll gain brand awareness with that logo, but you won't gain trust. Repeating your logo is good for building trust. When you've gained trust, you can just use a word mark or your corporate identity. Not the answer you're looking for? Browse other questions tagged user-behavior branding product-design logos or ask your own question. What impact does a red logo have? Does Hopper increase donations for Khan Academy?